Two Riverside employees recently attended conferences where they were able to display and discuss some of Riverside’s important projects. 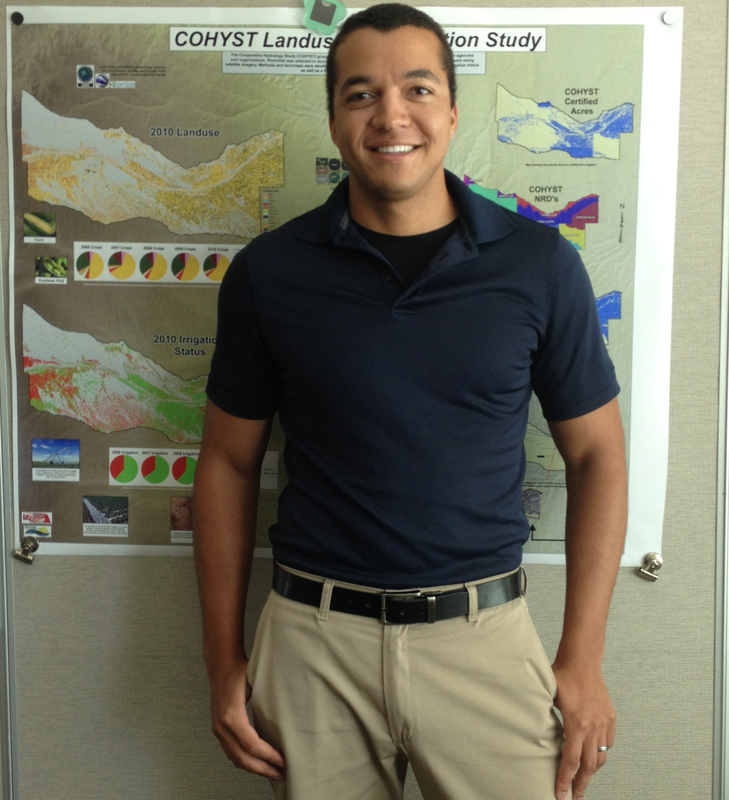 Ian Hageman’s poster, “COHYST Land Use and Irrigation Study,” was on display at the 2015 ESRI International User Conference in San Diego last week, which was attended by 16,000 people. 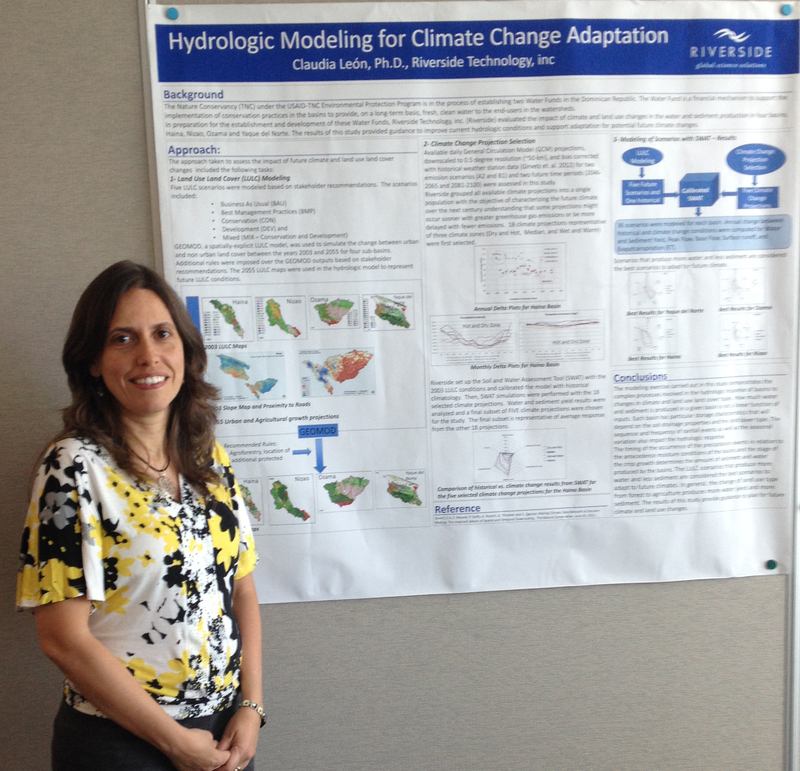 Claudia Leon discussed her technical poster, “Hydrologic Modeling for Climate Change Adaptation,” at the American Water Resources Association’s Summer Specialty Climate Change Adaptation conference in New Orleans in mid-June. These poster sessions are unique opportunities for Riverside employees to present their research information to groups of colleagues, partners, and potential clients. We’re proud that Ian and Claudia represent Riverside! Riverside recently completed a study for the Nile Basin Initiative (NBI), resulting in a design for a regional water resources monitoring system. The vast majority of the runoff in the Nile River is generated upstream of the confluence of its two main branches. The White Nile flows out of the equatorial lakes region, and the Blue Nile flows out of the Ethiopian highlands, where it is known as the Abbay River. The equatorial lakes region generates significant runoff, but much of it is lost to evaporation in the Sudd Marshes in South Sudan. Only 20 percent of the Main Nile flow is contributed from the White Nile. The Blue Nile contributes the majority of the flow in the Main Nile, and most of that comes during the late summer and early autumn months, resulting in a huge variability during the course of the year. Upstream development of water resources, particularly for agriculture, has the potential to reduce availability of downstream flows. This makes downstream countries feel vulnerable. The potential competition for water works against trust and fosters protective attitudes regarding sharing information that could give one country leverage over another in negotiations about water resources. The potential for collaboration on sharing of water resources information among so many countries is a historic opportunity, and the trust demonstrated by the countries’ willingness to participate in the study we have just completed is remarkable. As a design of a water resources monitoring network, our study was unique in the degree of effort placed on defining the specific transboundary socioeconomic benefits that would result from the network. This was essential to justify both the subsequent international support that will be required for implementation as well as the national cooperation that must be achieved, given that the network is comprised of station locations that are a part of existing national networks. As part of the study, members of our team traveled to each country participating in the study and undertook fieldwork to understand monitoring and data management practices, utility of water resources data, and technical capacity for operating and maintaining advanced hydro-meteorological networks. We also held four different workshops, convening representatives from participating countries to collaborate on objectives, design requirements, and implementation plans. NBI is moving forward with funding and implementation. If the countries can cooperate in this implementation and in the ultimate sharing of the data according the plans that have been laid out, this will truly be a strong foundation for cooperation in the development and management of the water resources of the Basin. Riverside is honored to have been recently awarded the opportunity to aid hydrometeorological agencies in Central America by implementing a Community Hydrologic Prediction System (CHPS) Flood Early Warning System (FEWS) platform in Nicaragua and Honduras and performing system enhancements to the existing CHPS system in El Salvador. The CHPS-FEWS system (developed by Deltares) is used throughout the US by the National Weather Service (NWS) River Forecast Centers. On this project, Riverside is a subcontractor to the University Corporation for Atmospheric Research (UCAR) Joint Office of Science Support (JOSS), which is operating in partnership with the US National Oceanic and Atmospheric Administration (NOAA) and US Agency for International Development (USAID). Riverside’s role on this project is, in part, follow-up work to our recent forecast system implementation project in El Salvador. CHPS-FEWS will initially be used as a data repository and quality control (QC) tool for forecasting systems in Nicaragua and Honduras. Other functionality will be added during the first year leading to a functional stream flow forecasting system for a pilot river basin. Representatives from El Salvador will support Riverside by actively participating in the training that will be provided in Nicaragua and Honduras on operational forecasting tasks.